Buying a race horse is usually a good investment, especially if you are passionate about racetracks. However, buying a thoroughbred usually has some risks. That’s why today we tell you everything you need to know so that the business of buying a race horse is fun – and not a suffering. The first thing you should evaluate before buying a thoroughbred is to know enough to make a good purchase. If so, rather than making wrong choices, look for an agent in charge of advising and recommending you. You can also look for horse trainers, who know a lot about the subject, especially when we talk about horse health. Accessing a union is also an option where you can share the expenses and profits of several horses at the same time. What you need to know before intervening in a union? Get all the information you can about it, since in many cases they are swindlers. It is very important to ask from whom you buy the horse. You should be able to ask anything from the seller. Missing enquiring about the diet is what many purchasers forget. Make sure you keep a check on every food item that has been given to the horse. It is because an abrupt change in diet can be somewhat risky, almost always leads to colic. Don’t go for change of concentrate if you see a fat and healthy horse. If the horse you bought presents a strange behavior, is a little nervous, do not worry at all. It is obvious to happen. This is normal due to the change of environment. Horses miss their stall but they are animals that attach very easily, in a matter of days and even hours. When buying a horse or choosing one to ride, we tend to be guided by its appearance or its abilities. We almost always overlook his temper. It must be complemented with our character or our style and riding preferences. If not, riding a horse can become a very unhelpful task. A hot-blooded horse is acutely aware of its surroundings. This makes him a little scary on the marches, and sometimes showing tense among a group of horses. If a rider only wants to take quiet walks, the warm-blooded horse will not be appropriate. 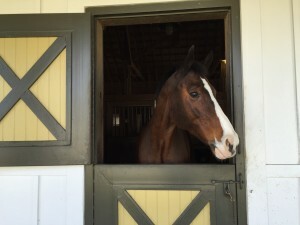 Have clear monthly expenses, since a horse needs between 25K to 30K dollars a year to stay in good condition. This includes all the things, the place where he will live, the food, the veterinarian. So, the investment is not a once in a lifetime. When buying the race horse, you can do it in one of three ways: in a claim race, in an auction or for a private purchase. In the first case a race is made of the horses that are for sale and the price is established before the race according to the quality of the horse. Also, the veterinarians cannot inspect them in advance. In the auctions the horses are grouped by type: foals, horses in training or breeding of mares; Each one has a catalog with all their data and veterinarians can see them. After this, you only have to obtain a license for races, a good coach, register the horse in the Jockey Club and choose the colors of your team. If you do not make a good investment, buying a racehorse can be a real headache. You must bear in mind that it is calculated that for every $ 100 invested in the horse, the owner receives a profit of $ 21 average. You should also know that many times the horses that are bought in associations can lead to problems with your partners, something that under no circumstances will you want. Therefore, if you want to have fun and have a true passion for horses, you must consider the steps you are going to take. The ideal is to start buying a shared one, as we said, with one or more partners or even with a union. If you are going to make an association, always remember that this is business outside of the emotion of seeing your purebred run at a racecourse: keep thinking with your head, and not with your emotions. You must have special confidence in the consultants you hire and let them do their job, since it is the only way, not only to do good business, but to be satisfied with the horse you have bought from a hobby point of view: you want a horse winner. She writes on various topics related to society, culture, academics, business and lifestyle. She is a guest post writer and an academic consultant for Assignment help for more than a decade.